M any families struggle to make ends meet during the holiday season and some are even left not knowing when their next meal will be. That is why PCMI is proud to have contributed to a great cause yet again this year to help aid in fighting hunger by hosting our 4th Annual Holiday Food Drive. All proceeds of the Food Drive this holiday season benefited the Maine Township Emergency Food Pantry. To any family struggling to put food on the table, we want to be there to help, to support our community, and to give back. In an effort to aid those in need, our Chicago team took action this year by setting up a Food Drive box in our kitchen. Employees participated by donating non-perishable food items, along with other goods and toiletries off of the pantry wish list, throughout the month of November. Just like the years before, all of our proceeds went to the Maine Township Food Pantry, which is located in Park Ridge, IL. This pantry is an established program that supplies 150 boxes of food every month to those in need. The program, established in 1981, provides food on an emergency basis to persons living in the greater Maine Township area and feeds over 300 individuals on a monthly basis. This is a program that PCMI is delighted to donate to every year, because of the good they provide to the community. 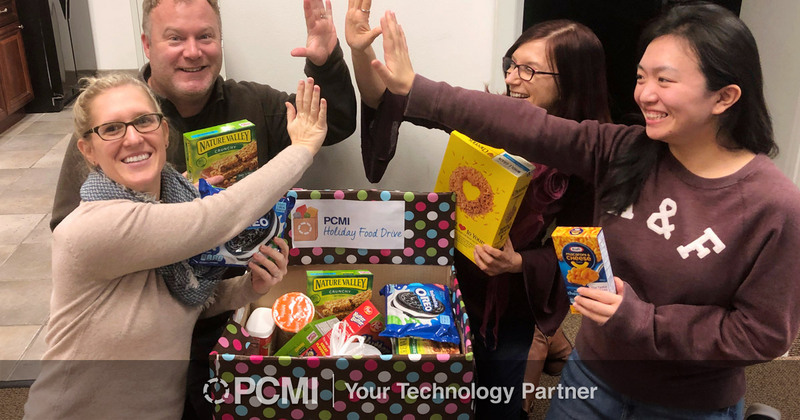 PCMI’s Food Drive was once again successful, with employees filling a large box full of different foods and toiletries to be delivered to the pantry. We would like to thank all those who donated and contributed to the cause, your generosity is greatly appreciated. The food items were dropped off at the Food Pantry last week, just in time for Thanksgiving, so those in need could enjoy a great holiday meal. We are proud to be a part of a great holiday tradition in which we can give to those in need, and we are looking forward to helping for many years to come.